It almost hurts to look at myself now. Was i really that big? People used to tell me i was enourmous but i dont remember ever feeling as big as that! 'Yes, just one baby' . 4 days to my due date. No wonder i hated reading stories to b2; her room is on the third floor! trudge trudge trudge at half past 8, just let me get my breath back before i start... that was story time for her over. we never went back! I think i have a rather crazy mad woman look in my eye...must have been the lack of carbs i was consuming to try and keep the beans weight down! Ha! Huge, uncomfortable, sleepless, counting down and just salad. Cruel. Please give him a big cuddle from the gnomes. Does B2 miss her story time? Happy Birthday Little Bean, sending a snuggly smooch your way. Happy Birthday to your Baby Bean. That's a great photo, and the birth story is also absolutely incredible. And...I think you started a bit late to try and keep his weight down....I'm just sayin...is all. He was a whopper! Most impressive. More photos required of him please, post apple pancakes preferably. A first birthday is a great time for a family portrait, in all combinations. Ooh, happy belated birthday Bean! And yep, you do look a little manic LOL, but then don't we all at that stage? veggie- thanks, you can also bestow him tomorrow! His biffdy is next weekend. 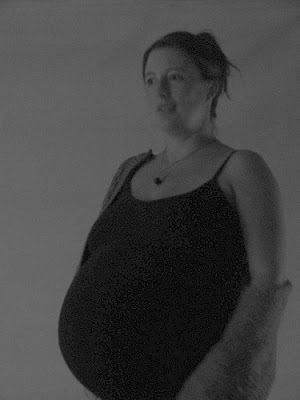 Picture was taken a few days before due date and a week before his birth. kerrie- thanks, preggo bellies are glorious arent they? major miracles. smooches deposited. laura jane - obviously 8 weeks before due date wasnt enough!! no carbs after lunch nearly killed me!!! still nearly killed me! His pizza party is next weekend so lots of pics no doubt and no doubt a post to match! and thanks for the portrait idea. Brilliant! Julie- thanks. Manic indeed, in hindsight im glad i was the pregnant one!Prolly gave them all hell!